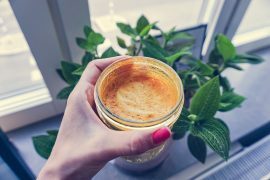 Golden mylk, also known as turmeric latte, is – as the latter name for it suggests – a warm drink made with various spices, turmeric being the main one. Golden, because turmeric is yellow (gold), and mylk is a word for non-dairy milk alternatives, such as nut milk or oat milk, which is used when making golden mylk. So, now that we’ve got that little explanation out of the way. Let’s talk Golden Mylk Bliss Balls! 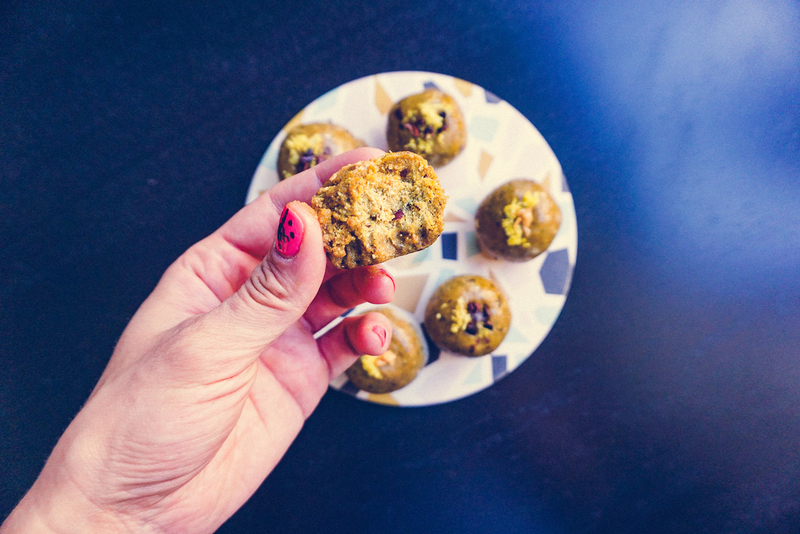 I have rolled a lot of different types of bliss balls (or raw balls) in my days, as the avid health food experimenter that I am, but these are definitely my current favorite. 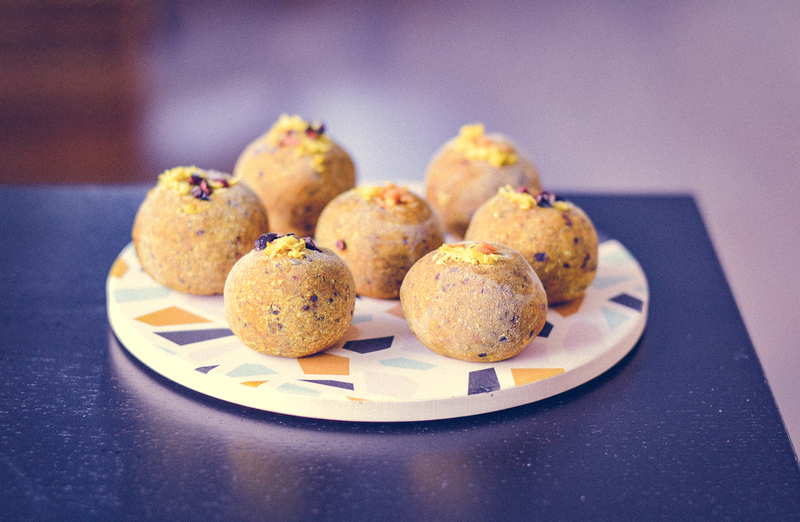 These bliss balls are a golden shade of yellow thanks to turmeric, and just like the aforementioned drink, have a spicy little kick to them. What are the spices in golden mylk bliss balls good for? 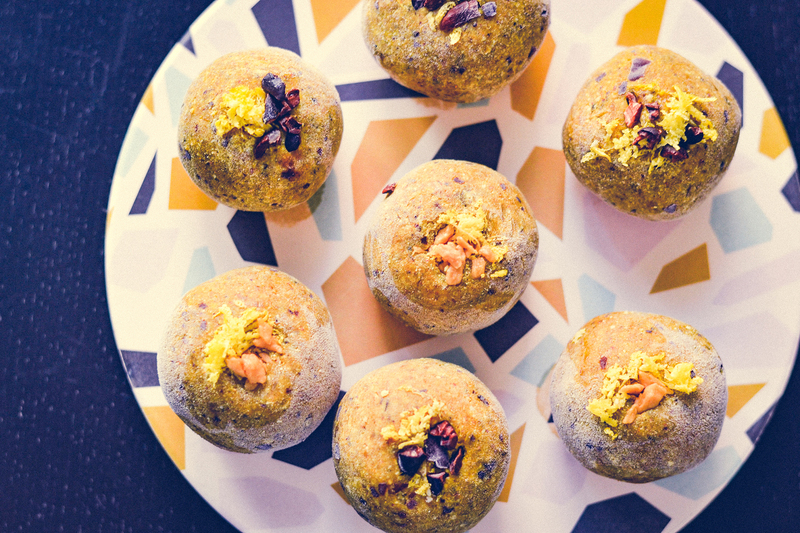 These Golden Mylk Bliss Balls are made with a mix of warm spices like ginger, cardamom, cinnamon, and even a tiny bit of black pepper. They’re a really nice afternoon snack for a little pick-me-up, the spices will give you a nice energy boost. Not to mention the healing powers of the healthy ingredients. Turmeric is said to have powerful anti-inflammatory effects, and is a strong antioxidant. Ginger is said to relieve nausea, motion sickness or pain and has been used as an energy boost and immune strengthener (ginger tea for colds, for example) for years. Cardamom is good for various digestive problems. Cinnamon is full of antioxidants, has anti-inflammatory properties and lowers blood sugar levels. A note about cinnamon: make sure you’re using cinnamon of the Ceylon variety. Most cinnamon you find in store is of the Cassia variety, which is cheaper but can be harmful in too large doses as it contains a compound called coumarin which is toxic to the liver and kidneys. 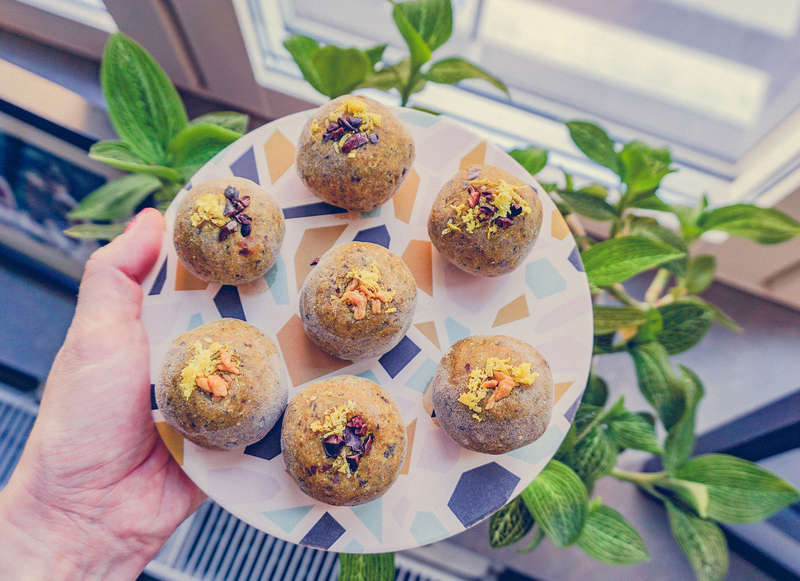 In addition to the health benefits of some of the ingredients in these golden mylk bliss balls, did I mention they taste great too? That’s probably all the argument you need to make them. Add all the ingredients to a food processor and pulse until everything is small crumbs and incorporated. Scrape down the sides with a spatula and then let the mixture blend for a couple of minutes until some of the oils from the nuts start to release and you get a mixture that you can form into balls. 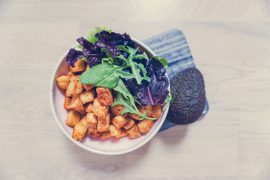 Roll into balls and press a little bit of garnish into the top of each bliss ball, then place on a tray in the freezer to set. I usually store my bliss balls in the freezer to last longer, but they’ll keep for a week in the fridge too. This post contains a select few sponsored links, that means that you’ll support Banana Bloom if you buy your baking ingredients via the links in this post. Thank you!